I’m Hoooooooooooooome: in the southwest corner of Idaho, Owyhee County, Oreana to be precise, “population 8, maybe 9,” with the Teeters (of endurance.net). Actually, I’m homeless and truck-less; now every time I stay in a place more than 2 days the word ‘home’ slips out, be it a hostel or tent, and any time I unpack my suitcase, I start to throw a few shallow roots into the ground. However, I’ve been to Oreana twice before, and it is like home. I first met Steph and John in Ridgecrest California 3 winters ago, where I was riding for Jackie Bumgardner and they were escaping the cold winter in Idaho. (That was also the year I invited myself along with Steph and Jackie to Egypt, but that’s another long story.) I then visited the Teeters in Oreana for a few days on my way somewhere, and just fell in love with the place. Then in the fall Gretchen and I went to their 5-day Owyhee Canyonlands ride, and I stayed on to housesit for 10 days, then I stayed on another month. (They couldn’t get rid of me.) 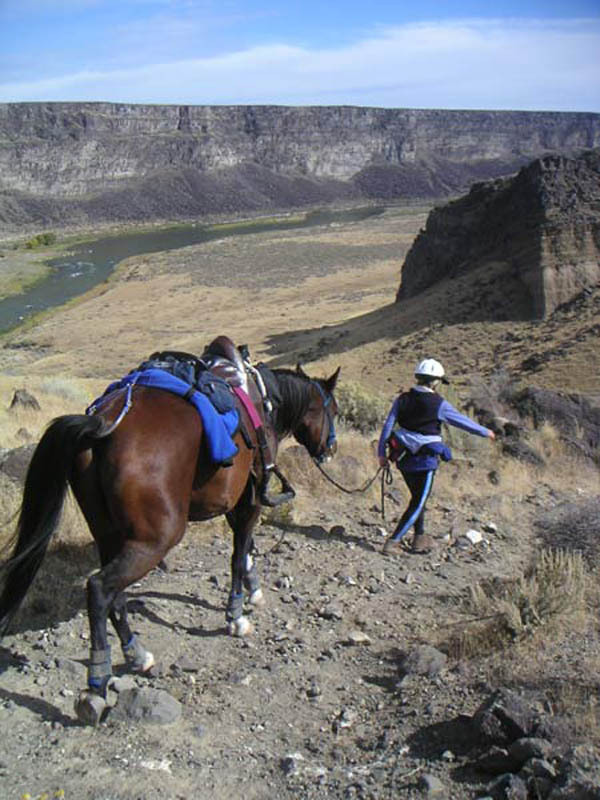 The Teeters live 5 miles up a creek that is settled entirely on the upper end by endurance riders. 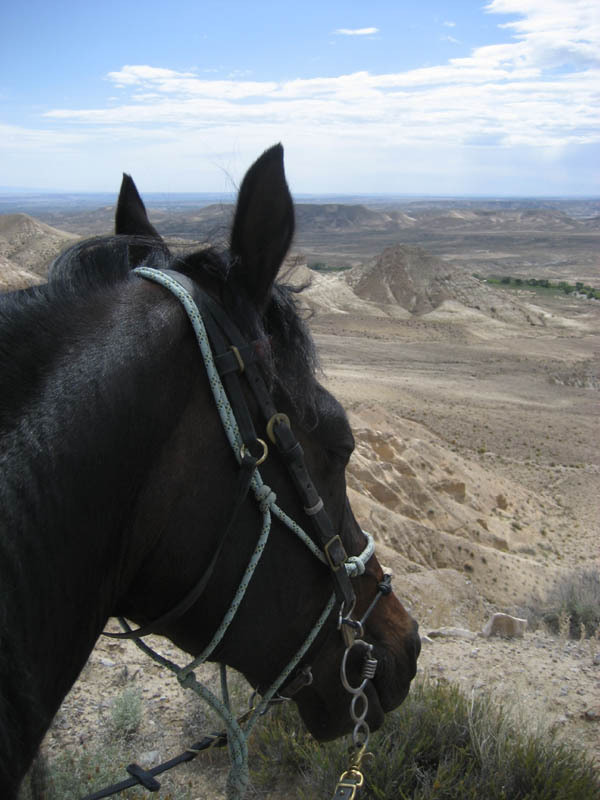 They’re surrounded on 3 sides by BLM land where you can ride forever. Sometimes we do! Steph and John put on about 3 endurance rides a year here, a 3-day ride in May, a 5-day ride in the fall, and another 100 miler thrown in there, which this year is the AERC National Championships, 50 and 100 miles. 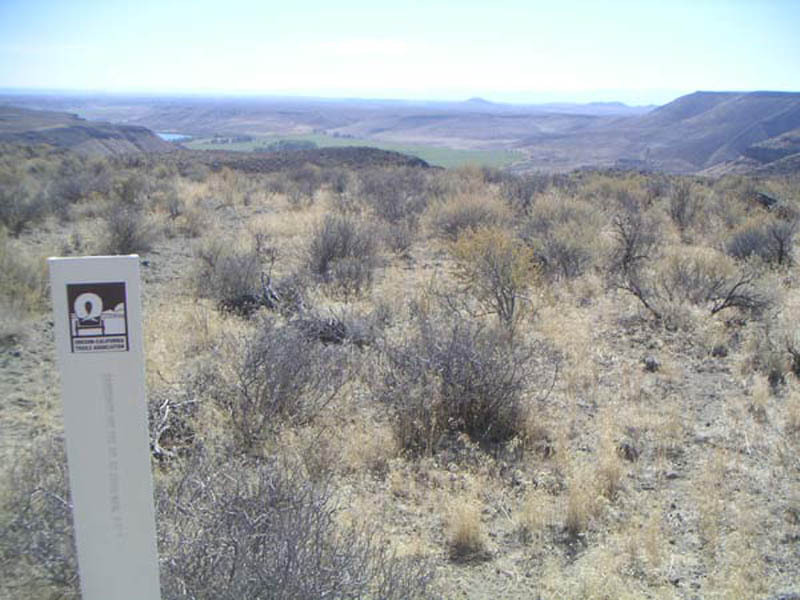 This weekend is the Owyhee 100 Elevator Ride 60/80/100 (Saturday), and the Owyhee Rangelands I and II 25/50 (Sunday and Monday). If you haven’t done a Teeter ride, you’re missing out. It’s great high desert country (basecamp is at about 3200 feet) to ride in where you get to see a variety of terrain – you ride across the desert, on hill ridges, in canyons sheltering great cottonwoods, by the Snake River Birds of Prey Conservation area (home to the largest concentration of raptors in North America), on the original Oregon Trail. 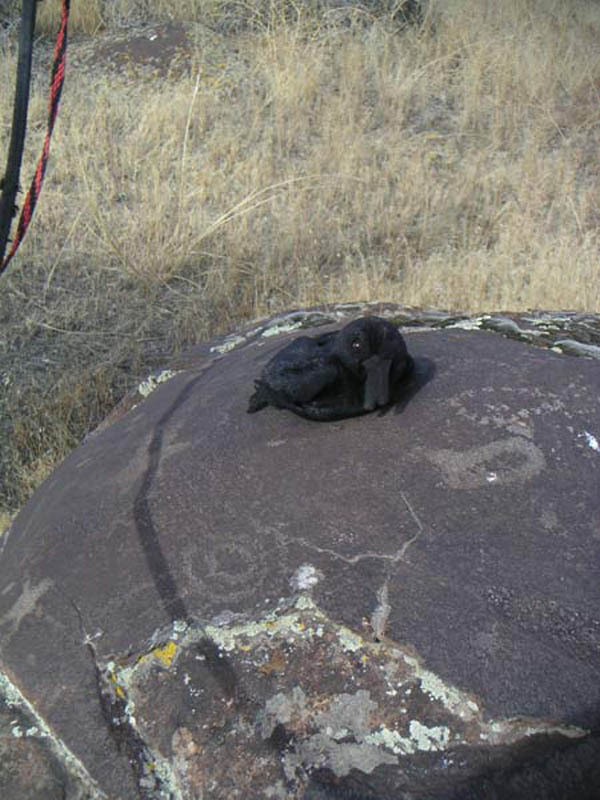 One day’s trail takes you to the Snake River and down into the canyon among the petroglyphs – my RAVEN (may the Great Bird Spirit Rest His Feathers, er, black cloth) did this ride and posed on the petroglyph rocks. Then of course there’s good completion awards and great catered dinners, wireless internet access for the people who can’t travel without their computers (ahem), and the weather is usually cooperative. Currently it’s not so hot! So, I’m back home for the Owyhee Rangelands ride. The suitcase is unpacked for 3 weeks (then I’m off to Europe!). The day after I got to Oreana from my three months in Malaysia, New Zealand and Australia, I hopped right back into riding, two horses a day… Steph has plenty of horses to ride, and no time to ride them!